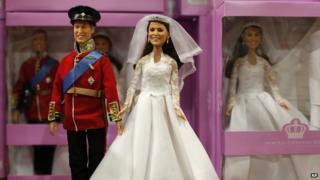 Dolls of Prince William and his wife Kate dressed in exact copies of their wedding outfits have been released for sale. The Kate doll comes with a tiara, earrings, shoes and even engagement and wedding rings. And the Prince William doll is dressed in a red Irish Guards colonel uniform with pink socks and shoes with the letter W marked on them. The dolls have been made by British company Arklu. The price of the pair is £100 but Kate can be bought separately for £50. One pound from the sale of each doll will go to the Royal National Lifeboat Institution.